Attawapiskat First Nation Chief Theresa Spence is urging unity among protesters and aboriginal leaders in the grassroots Idle No More movement. Attawapiskat Chief Theresa Spence is urging unity among protesters and aboriginal leaders in the grassroots Idle No More movement, as she enters day 23 of her hunger strike aimed at winning a meeting with Prime Minister Stephen Harper. "We need to continue to encourage and stand in solidarity as Indigenous Nations," Spence said in a statement Wednesday. "We are at a historical moment in time, and I ask that grassroots, chiefs and all community members come together in one voice." Spence launched her hunger strike on Dec. 11, days after the House of Commons passed the Conservative government's omnibus budget legislation, Bill C-45, which organizers with Idle No More say violate treaty rights and weaken environmental laws. Protests have been held in many Canadian communities and outside the country since the movement began late last year, as a campaign by four women from Saskatchewan to oppose a number of bills before Parliament, including the omnibus budget legislation. 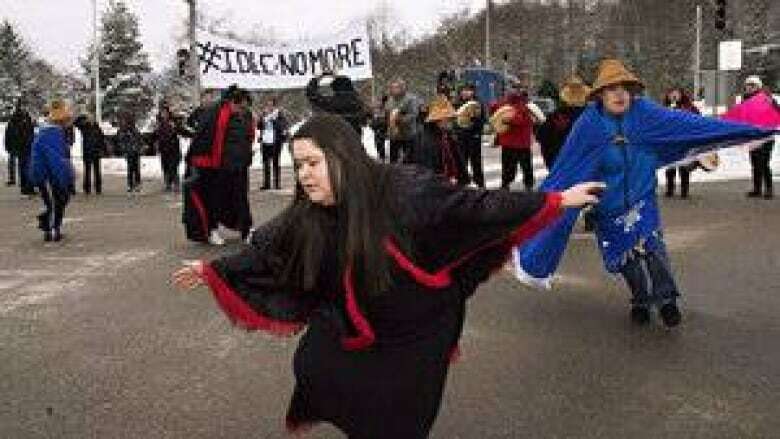 Idle No More has quickly gained momentum, particularly with a new generation of young, social-media-savvy activists. Thousands have used the #idlenomore hashtag on Twitter to debate issues and spread information about upcoming protests. One of the debates the movement is wrestling with as it grows spilled into public view on Monday. Founding organizers in Saskatchewan posted a statement online saying that elected First Nations chiefs do not speak for the social movement. "The chiefs have called for action, and anyone who chooses can join with them, however this is not part of the Idle No More movement," the statement said. "While we appreciate the individual support we have received from the chiefs and councillors, we have been given a clear mandate by the grassroots to work outside the system of government, and that is what we will continue to do." Organizers point out that the Idle No More movement began before Spence's hunger strike, and say there are separate but complementary forces at work trying to boost pressure on the federal government to enter talks with Canada's aboriginal peoples. One is the grassroots campaign known as Idle No More. Another is Spence, backed by a group of First Nations leaders who say have been discussing plans to launch a campaign of "economic disruption" by mid-January if Harper fails to agree to a meeting. Pamela Palmater, a politics professor and leader with Idle No More, said the movement has remained largely united as it has gained momentum and that any debate over leadership has to do with who sets the agenda. "I think what [the founders of Idle No More] were trying to convey was that they don't want the First Nations political organizations to take the reins, and decide what will and won't happen with the grassroots people," Palmeter said in a phone interview from her office at Ryerson University. "But that's different from us as Idle No More working with the chiefs on the ground," she added. "This whole movement started out with that partnership and we've maintained that partnership all the way through." Palmater said that while the impetus for the movement was the Conservative government's omnibus budget bill and a raft of legislation that would cut funds to First Nations organizations and communities, the long-term goal of the movement is to "get this treaty relationship back on track so that we're all sharing the land and resources in an equitable way." The demonstrations appear to be spreading, with another First Nations community in Quebec setting up a new blockade, and more events planned in various parts of the country in the coming days. Protesters from the Gesgapegiag Mi’gmaq First Nation set up the blockade on Highway 132 in Quebec's Gaspé region Tuesday evening, and a group of demonstrators from the Listuguj Mi’gmaq First Nation are blocking a rail line west of Gesgapegiag, saying they plan to maintain the blockade of the tracks at Pointe-à-la-Croix for as long as necessary. Alexander Morrison, a spokesman for the protesters at the train-line blockade, said the group is targeting "trains which are transporting our resources that were exploited here in our backyard with little or no benefit to our people." An Idle No More rally was also planned in Winnipeg Wednesday afternoon. As well, the president of the Union of B.C. Indian Chiefs says a protest will take place this weekend at a major border crossing south of Vancouver. On Sunday, a visibly weakened Spence held a rare news conference from the site of her hunger strike, on an island in the Ottawa River across from Parliament Hill. Morrison said he hopes the Gaspé rail-line blockade will help boost pressure on Harper to agree to a meeting and keeping Spence from endangering her health further. "Trainloads of wood and truckloads of wood drive through our community that were cut in our backyard — these are our resources in our territory," Morrison said. "And we have to watch this day in, day out, while our people are having a hard time. "All we want to do is share in the resources and work together, but have our fair share. That's the whole point, and it's due time that this has happened."